You are here: Home / Branding & Consumerism / 150 Kids’ Virtual Worlds: 95 Live, 68 in R&D; How Many Are Worthy? Seems everyone is in L.A. for the Virtual Worlds Expo except me right now, with e-mails and schmooze plans flinging back and forth like a gamer leader board. No, gang, I can’t make it to dinner, but yes, I DO wish someone would crosspost some of these fly-on-the-wall conversations on Utterz as I’m sure key connections will transpire and I want to track anyone using innovation for education or championing positive change. Looking at the 150 list and links to all the sites on the schedule, I’m particularly eager to hear more about EduSim, (free, 3D, open-source, multi-user collaborative learning) Me2 which is a virtual universe that literally ties play/points to how much kids get moving offline (requires a purchasable gizmo) and Elf Island which I first heard about via Izzy Neis here and now here, which holds considerable promise in Gaming for Good (TM), with kids helping in the real world, and online to offline positive practices. As for the ‘retail to rev gen’ model of purchasing something necessary to engage online (Webkinz toys, Bella Sara horse cards, etc.) 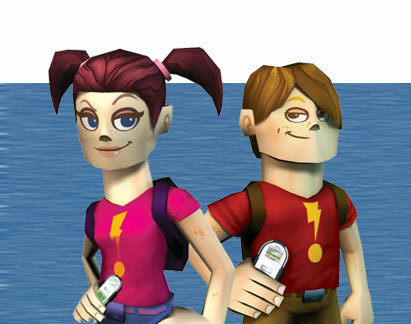 I WILL say the Me2 universe (avatar sample at left) is the first device that actually makes me think, ‘hmn’ since it’s tied to ACTUAL exercise in yet another fitness attempt to tackle the gaming+obesity equation. HopeLab’s Ruckus Nation was brilliant with all sorts of clever media/marketing ideas to get kids moving and engaged, so if Me2 is remotely close on the solutions front, it could be watch-worthy indeed. No question we’re all working to solve some tough conundrums on the childhood obesity and public health front…Is a VW/media/marketing interplay the e-ticket? Hard to say. And if Liam O’Donnell of Feeding Change or our own Shaping Youth Correspondent Sara Grimes of Gamine Expedition are there, please let me know if we’re making any headway in hopscotching over coinage and consumption into more meaningful content in the virtual world arena, ‘k? …”It’s important to remember, that the workarounds and codes represent a secret, and very meaningful, parallel universe that the players themselves have created out of a world that was not meeting their needs. And this is something that Mattel and other creators of children’s virtual worlds really ought to take note of. It’s inevitable that girls will say and do things in their play and online that many adults won’t agree with. It won’t all be “super nice,” and it won’t always correspond with a particular brand identity. That’s just the way play is. Scott is sharing the podiurm with Patti Purcell, Principal of their elementary school pilot program where they’re using virtual worlds to impart core values and ‘character pillars’ such as caring, citizenship, fairness, respect, responsibility and trustworthiness, so I’m interested in the outcomes. My favorite deforestation/renewal of 15,000 VIRTUAL trees planted online, which grew into a partnership project with the Arbor Day Foundation to plant 15,000 REAL trees offline…is an outcome in and of itself. Also see “Treetures” partnering with the USDA forest service along these lines, and as mentioned, the “Mirrored Gaming” Elf Island hopefully brings forth. My interview with Scott Arpajian will finally post on Eco Child’s Play Friday of THIS week and continue on Shaping Youth NEXT week as we kick off the fall B2S season with an all-star selection of uplifting, positive picks! If you’re wondering about my choice to post all of these inspiring minds on Eco Child’s Play PRIOR to my own blog at Shaping Youth, it’s quite simple…I know myself well enough to know I can’t hush up and will need MUCH more room to tell the full story of their promising plans for more meaningful content out there! ECP keeps it ‘short’ with so many fresh bursts of info in their Green Options network! Next up after Scott’s interview on ECP will be thought leader and Chief Playwright Michael Carter of Zookazoo…followed by Jason Devaney of Living Folklore and GiggleBubble Media and a check-in with the HulalaGirls “green gaming” site . Which reminds me…any young passionistas and garage-gurus in the 18-25 year-old range eager to bring projects to market with world changing concepts, have at it…prizes range from $5000-$30,000 in that category! The Young Innovator Awards in the Digital Media Learning Competition via the MacArthur Foundation and Hastac are underway and INTERNATIONAL this year…More on the DML competition in a full feature tomorrow, but for now, all of you Changebloggers and young gamers that are meeting tonight at the Virtual World Expo, heads up! Some of those ideas scribbled on the back of a cocktail napkin could probably make it into the DML deadline by Oct. 15th!! For those like me who could NOT make it to the Virtual World Expo in L.A., word has it we should save the date: November 13 to attend Kids Online: Balancing Safety and Fun. An ‘UnConference’ On Issues & Best Practices organized by Kaliya Hamlin, Joi Podgorny, and Denise Tayloe CEO of kids’ COPPA compliance privacy site Privo. So I found this interesting site. http://www.garrysmod.com/?dont_buff_my_pylon=615&BerlinWall_map_released! Its a Half Life 2 mod that allows the player to live as an east German trying to make their way into US controlled west Germany. I downloaded it and played it last night. It was quite small as far as mods go, but very well done. I cant help but wonder what kind of history lessons could be gained from game ideas like this. Of course there are plenty of war games that are very true to what actually happened, but not all of history was war. I would love to see a game based on 1776 Philadelphia. An RPG experience that could teach students about the formation of this country by actually living in. You could even attend a meeting of the continental congress. How cool would that be?! I have hope for the future Amy, there are plenty of talented developers out there and plenty of kids willing to learn. I still have the virtual jazz world in my queue and need to do a piece on recreating same…just not enough hours in the day. All: Safety goddess Anne Collier has just sent a recap of her experiences at VW L.A.—I loved her points/picks as usual, as she always has such balanced POV and erudite commentary in terms of what she has to say. For those who aren’t familiar with Anne, see our sidebar under ConnectSafely.org and NetFamily News!!! She’s awesome. One thing that’s clear from the research but was confirmed everywhere I turned at the conference: digital ethics and citizenship have to be central to the discussion as we learn how to negotiate this new space where — definitely for kids, in any case – the line between online and offline is fading. Learning how to behave ethically in community whether digital or physical is central to children’s well-being online, right now and increasingly as we move forward. 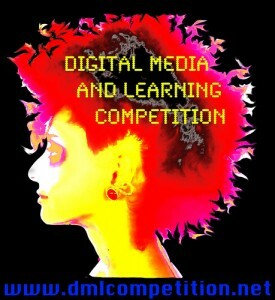 Really exciting projects are going on in and with virtual worlds in schools around the US and world. Check out the collaborative work between schools in California, Japan, and Australia at PacRim Exchange ; among youth librarians of the Eye4You Alliance ; on virtual islands for public school students (Ramapo Islands) in Teen Second Life ; and in Second Life and New York City (which is which?) with nonprofit Global Kids, which aims to help “transform urban youth into successful students as well as global and community leaders” (I want to zoom in on some of these in future posts). I also spoke with a northern California elementary school principal, Patti Purcell, about her school’s powerful project teaching students digital citizenship “in world” and in the classroom with the help of children’s virtual world Dizzywood. (see our sidebar) HIGHLY RECOMMEND!!! Amy, thanks for the meaty post, including the kind words about my field trip report. I did end up saying a bit more about the Bel Aire school’s very cool pilot with Dizzywood in my site than in the newsletter. I’ll be posting about Sara’s report on the BarbieGirls phenomenon – thanks for pointing it out. Didn’t run into any Elf Island folk, strangely – wish I had. Watched the Me2 demo, which was compelling as a concept but didn’t impress me that much. I’m all for getting kids away from screens and active, but they’d have to convince me of their kid market, not just how compelling parents might find it. Reminded me a little of the LeapFrog phenomenon, which really targeted parents and looked full of fun stealth learning (I bought the system for my 6-yr-old at the time, and he lost interest faster than it took me to shop for it). Me2’s kid focus groups may’ve found it cool, but do kids in non-artificial, non-focus-group settings really want to carry around *two* “cool” phone-size devices in their pockets (when many already have the real thing)? Gosh, am I getting cynical? Tx again for all your great thinking! um…okay, would that be the real one or is there a virtual world? woogiworld.com is a very safe website and my daughter loves it! 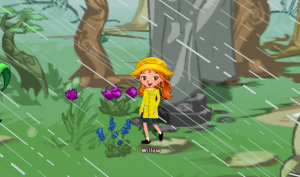 .-= Virutal Worlds For Kids´s last blog ..Mimo Plays Woozworld! =-.